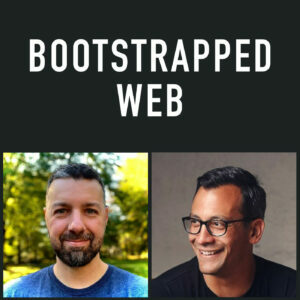 Welcome to Bootstrapped Web, Episode 88. We’ve been talking and decided that we are going to tweak the episode format, just a little, making them shorter and tighter. We’ll still do our personal updates, alternating every other week, with a topic or topics that you’d like to hear about. Today’s episode is our weekly update. Jordan has a two part update. The first part is a “mini-rant” about the rollercoaster he’s been on. Jordan’s been selling on CartHook’s features, but one of his marketing gurus is telling him he needs to zero in on the emotion and the story. But he’s so busy, it’s almost impossible to zero in on any one thing. He talks about how it’s all exhausting and exciting at the same time. And how that creates pressure and stress – but that pressure creates magic – Jordan feels he’s had some of the best ideas working under those conditions – he’s working on giving the ideas a little bit of life instead of shoving them away for the to-do list. 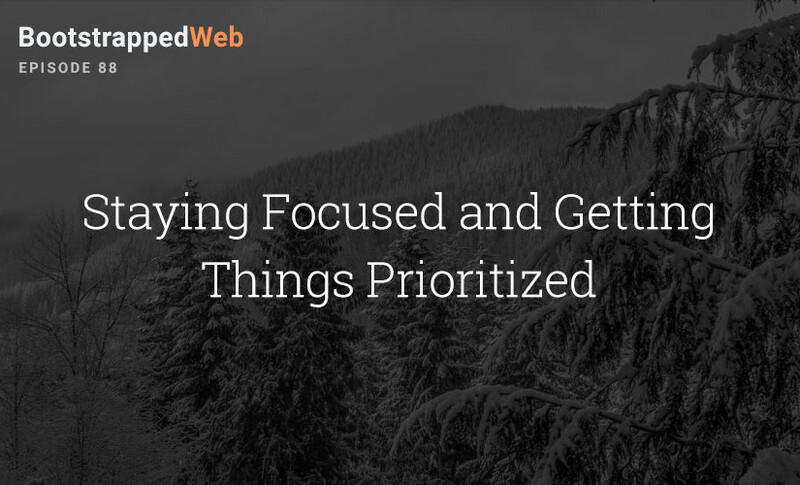 Prioritizing is the thing. The more things that you try to get done, the less things get done. Beyond the emotions, it’s been a busy week. He just migrated over to a new infrastructure for the whole app, basically rewrote the whole thing for a more modern framework. It’s been two hectic weeks of work that customers don’t really see but was totally necessary. They took on a few big clients over the summer and it totally strained the system. They needed to put preparations in place to scale the business. Brian is halfway through his stay in Asheville, NC and is hiking and eating his way through the trip. He’s trying to coincide his travel and business schedule, and his goal is to get the sales and marketing systems up and running for Audience Ops before he leaves. In the last few weeks he’s launched the Audience Ops blog, he working on an inbound sales system and he’s been busy writing an email course which is due to launch in the next few weeks. That’ll be one of those long term inbound assets. He needed a short-term strategy though, to get business in now. He had started some cold emailing, met with some success, and then went into system mode to see how he could scale it without himself. It’s since been put into play. He also invited a handful of people to use the beta and the plug in is just about ready to launch. He still needs to put a few pieces in place before launch but is anticipating a full launch in the next few weeks. He also recently reached out and asked for testimonials and feedback for Audience Ops. It was a bit daunting but after a review of the Google Analytics and some good reporting, it was easier to ask and now has some great quotes on his homepage. Brian and Jordan discuss prioritization and getting the work done. Everyone’s afraid of the shiny object, but there is a difference between the shiny object and pushing the vision of the company that you’re working on right now. The shiny object is something that pulls you away from your top priority, or pulls you out of and away from your company. What isn’t the shiny object, but what is the bigger picture? It’s not just the done-for-you service, it’s so much more. There are some things that need to be shelved for now, while you focus on the now picture, but shouldn’t necessarily be dismissed as a shiny object. Jordan feels most limited by resources. It’s important to stay focused and not distracted. Next week we’ll talk about outbound sales and some affiliate stuff. Looking forward to it.